Researchers have used the radioactive fallout from atomic bomb tests to show that new neurons are produced in one part of the human brain throughout life. Studies have shown that rats can grow new neurons, but there was little definitive evidence that it happens in humans too. When atomic bombs were tested between 1945 and 1963, radioactive particles were released into the Earth’s atmosphere. Among the isotopes created was carbon-14, which is commonly used in radio carbon dating. As cells divide, they incorporate carbon from the environment, and some of that carbon comes from the atmosphere. That is why carbon-14 released by the atomic bombs found its way into the DNA of multiplying cells. The amount of carbon-14 in this DNA corresponded to its concentration in the atmosphere at the time the new cells were born. This essentially meant carbon-14 in DNA can be used as a measure of the age of cells, such as neurons in adult brains. A team led by Jonas Frisén at the Karolinska Institute, used brain cells obtained from 120 people who had consented to have their cells used for experiments after their death. Of the cells analysed, some had much higher levels of carbon-14 than others. This meant that the cells with lower levels were produced after 1963, when bomb testing ceased, and therefore showed that new cells can be produced later in life. “The idea was to contrast the hippocampus region of the brain with the rest,” study co-author Kirsty Spalding said. They wanted to confirm the hypothesis that new neurons are only formed in the hippocampus, which plays an important role the formation of memory. The results of their study have been published in the journal Cell today. The team measured the amount of carbon-14 present in the DNA of neurons in the hippocampus and, separately, in the rest of the brain. 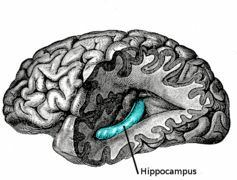 They then used complex calculations to model the results, which confirmed that new neurons are produced only in the hippocampus. There were two surprising discoveries. First, these new neurons were produced in small part of the hippocampus called the dentate gyrus. The rest of the hippocampus (and indeed the rest of the brain) showed no formation of new neurons. Second, about 700 neurons were produced every day, which turns out to be a turnover rate of about 1.75% per year. These neurons also lived about three years less than the ones that do not undergo replacement. According to Kempermann, by staying “forever young” the dentate gyrus could play a key role in the difficult task of learning, memory formation and the shaping of individual personalities. That might be quite a jump from the mere fact that new neurons are formed in the brain. But that jump dwarfs the results of this study, in which nuclear bombs—arguably the most destructive aspect of the human legacy—led to advances in brain science. First published on The Conversation.